Last Wednesday night, Lockerby hosted its largest event of the year, Cancer Drive! The night was absolutely spectacular! Throughout the night, the Kids Caring for Kids Cancer Drive Committee worked hard to make the night successful. The committee helped teachers organize their teams before they sent out the students to go canvasing, the committee also went out door to door collecting donations and cleaned up at the end of the night. In the Lockerby library, student’s would find their team table and hand over the donations that they collected that night to a teacher at the table to count the amount for them. Students would be amazed and blown away by the amount of donations that they raised individually in one night. Some groups collected hundreds of dollars. The total donations raised was calculated late Wednesday night. For those who stayed late that night it was amazing to know that as a school we raised $44,500 for pediatric cancer care in the North! That night there were lots of cheer, smiles, clapping hands and the moments were captured by many pictures. It was truly a night to celebrate! 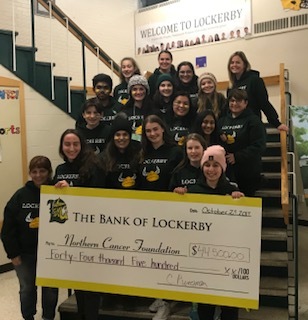 The Cancer Drive committee set up the large cheque on an easel in the main lobby and they wrote the amount raised on many doors and windows to display the amount raised to all Lockerby students. This event makes you feel proud to be a Viking! A thank you goes out to all those who volunteered their time and made contributions to our Cancer Drive! It is amazing what we can do together, as a school and as a community to support those who need it. Raised here! Stays Here!